« Three Streets Named After One Person! A Street Named After a Church? 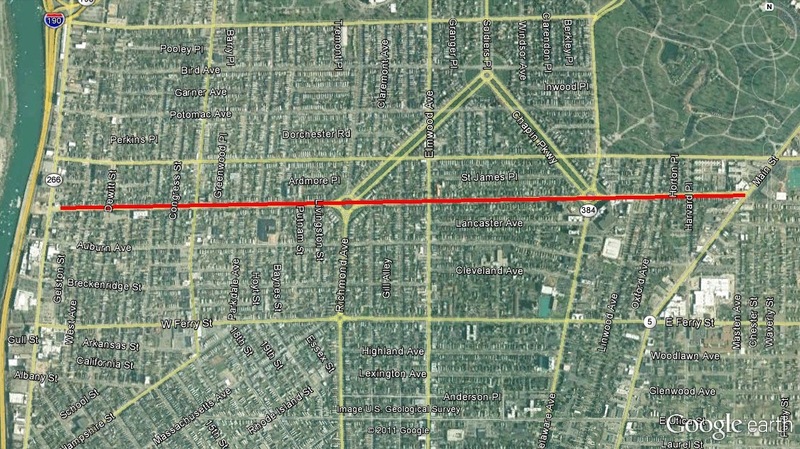 Lafayette Avenue runs approximately 2 miles from west to east across the center of Buffalo, from Main Street to Niagara Street. Lafayette Avenue crosses both Gates Circle and Colonial Circle. The street was originally named Bouck Avenue. There was a Governor of New York, William Bouck, but don’t quote me on it being named after him. Before he was Governor, Bouck was involved in the building of the Erie Canal; his job was to bring the money to the workers in the western portion of the state. Lafayette Square, located at Main Street between Broadway and Clinton, was originally laid out by Joseph Ellicott in 1804. Lafayette Square was known in those days as Courthouse Square. 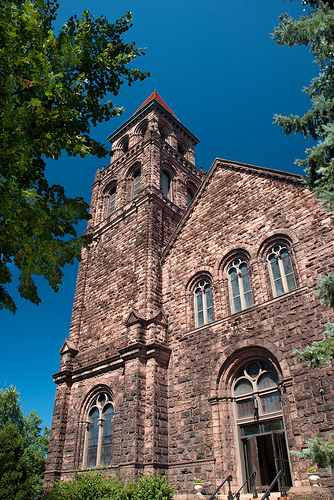 The Courthouse was located where the Buffalo and Erie County Public Library is currently located. General Lafayette came to Buffalo in 1825. When he was in Buffalo, the Village had a population of approximately 2,400 citizens. The Erie Canal was just about to open and it was the 50th anniversary of the Revolutionary War. General Lafayette was a hero of the American Revolution. He served an aid to Washington and named his son George Washington Lafayette. 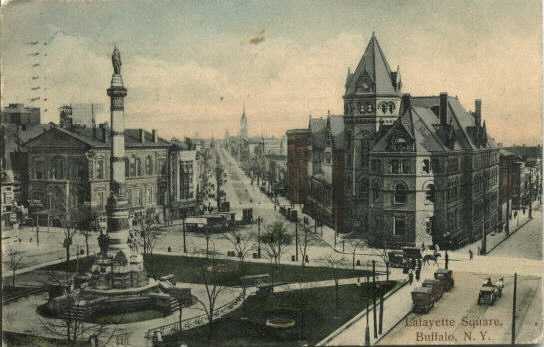 Lafayette traveled around the country; he stopped by Buffalo on his way to Boston. He arrived from Dunkirk via a steamer named the Superior. He was welcomed by great fanfare, and stayed in the Rathburn Hotel on Main Street near Court. General Peter Porter and Red Jacket were in attendance when Lafayette gave a speech from a platform in front of the hotel, facing the Square. In 1878, some people wanted to rename the square Heacock park in honor of Gosvenor Heacock. A separate group proposed to name it Washington Park. Eventually, the Council found agreement, and decided to name it Lafayette Square. In 1833, the First Free Congregational Church located on the north side of Courthouse Square, the current location of the Rand Building. The church went through several different names throughout the years, and became Lafayette Presbyterian Church. They were located on Lafayette Square until 1894. They moved further out towards the countryside at the time, in order to have more space to grow. They found a home on Elmwood Avenue, at the corner of what was known as Bouck Avenue. They requested that the city name the street in honor of the congregation, and the City obliged. So next time you drive past the intersection of Elmwood and Lafayette, take a look at the church. It’s the only church I know that has a street named after it! Grande, Joseph. “Lafayette’s Triumphant Tour of Buffalo and the Niagara Frontier”. Found in Bicentennial of the American Revolution to Niagara Land published by the Buffalo Courier Express. Nagle, Roy. “Many Changes Made in Names of Streets Here”. Courier Express, August 25, 1928.